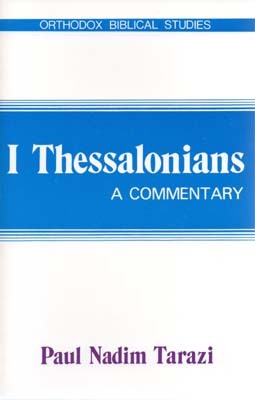 The First Epistle to the Thessalonians is the oldest of the writings which have been gathered into the New Testament. In reading it we can sense the powerful impact made by St Paul's preaching of the Gospel as well as the Apostle's continuing prayerful concern for this new mission church. We also discover St Paul's understanding of the Second Coming of Christ as he deals with the perennial question of "those who have fallen asleep." This important contribution to Orthodox biblical studies offers many helpful insights for all who wish to understand the bible better, experts and novices alike. Its author, Fr Paul Tarazi, Assistant Professor of Old Testament at St Vladimir's Seminary, clearly demonstrates the importance of discovering what the scriptural text itself is saying. size: 8.3 x 5.4 x 0.6"